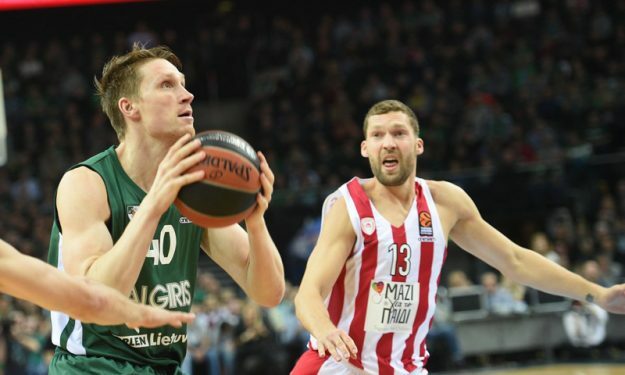 Zalgiris used a second-half comeback to overcome Olympiacos in Kaunas. Zalgiris Kaunas prevailed over Olympiacos Piraeus at home with an 83-75 victory in Round 11 of Turkish Airlines EuroLeague, in their first meeting since last season playoff series that sent the Lithuanians to the Final Four. This marks the Lithuanian side’s fifth win of the season. This victory was total teamwork for Sarunas Jasikevicius’ squad, as multiple Zalgiris players scored in double-digits. Marius Grigonis led his team with a career-high of 19 points and a key presence in the final period, Nate Wolters followed with 13 points, while Antanas Kavaliauskas added 12 points. Despite being trailed for nearly 30 minutes, the hosts grabbed the lead of the game right before the end of the third quarter with 60-59 and with an 8-0 run in the final one managed to turn the momentum of the game around and even grabbed a double-digit lead near the end. “I feel great, we were down in a big hole and the only way for us is defense, we showed it in the third and fourth quarters. The guys have to be proud of themselves, it’s an amazing performance. It’s a man’s win”, commented Jasikevicius after the game. Olympiacos, that now falls to 6-5, had a powerful start to the game but couldn’t keep up the pace, despite Giorgos Printezis’ 18-point performance. “We lost zero ball in the first half and 16 in the second. You don’t need to be a genius to figure out what the result is“, mentioned David Blatt in his post-game quotes.